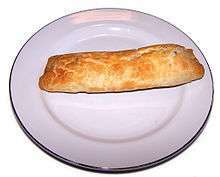 The Bedfordshire Clanger is a dish from the English county of Bedfordshire, dating back to at least the 19th century. The clanger is an elongated suet crust dumpling similar to a pasty, with a savoury filling at one end and a sweet filling at the other, comprising a main course and dessert in one package. It is traditionally steamed but may be baked for robustness. The crust was not originally intended for consumption but to protect the fillings from the soiled hands of the workers.